Understanding plate tectonics will help us add mountain ranges that make sense. A planet surface is composed of an outermost shell of slowly moving plates, which either converge on each other, diverge, or transform. The first two are the motions that create mountains ranges and volcanoes. Most volcanoes occur where two plate boundaries intersect, but some volcanoes exist in the middle of plates due to flaws in the plates; this means we can have a volcano anywhere on our map and no one can tell us otherwise. There’s a reason the western United States has major earthquakes and volcanoes and the eastern doesn’t. The continental shelf is the area of land that’s underwater just offshore. It is shallow compared to the deeper ocean. On the east coast, the shelf is wide, which means the plate boundary is also far away. By contrast, the west coast’s shelf is narrow, ending just offshore. This means the deep ocean isn’t far away. More importantly, the plate boundary is near the west coast, causing dramatic boundary activity that results in mountains and volcanoes. Such a situation is true on other continents and is something to consider. If we say that deep water lies just off the coast of a continent, there are probably nearby mountains, some volcanic. We can also approach that in reverse: a coastal mountain range likely has deep water not far from shore. Ship wrecks there will be far under the waves. If we have a water-dwelling, humanoid species, or even sea monsters, they might be found here. Using the U.S. as an example, a giant sea monster is more likely to be encountered near the west coast than the east. When two plates converge, one destroying the other’s edge, the results can be varied. 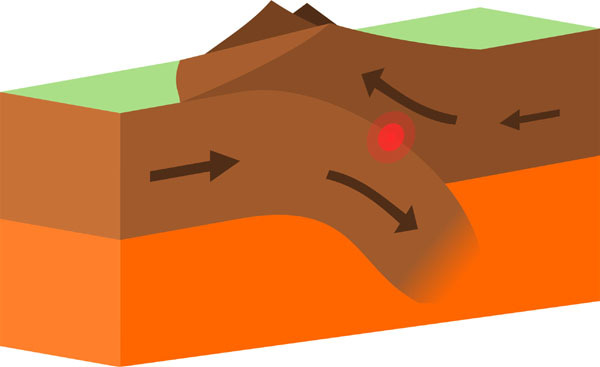 If subduction, in which one plate is forced under another, happens at an ocean-to-continent boundary, the ocean plate plunges under the continent, causing a continental mountain range. This range will be parallel to the coast (plates), with volcanoes that are the most explosive. 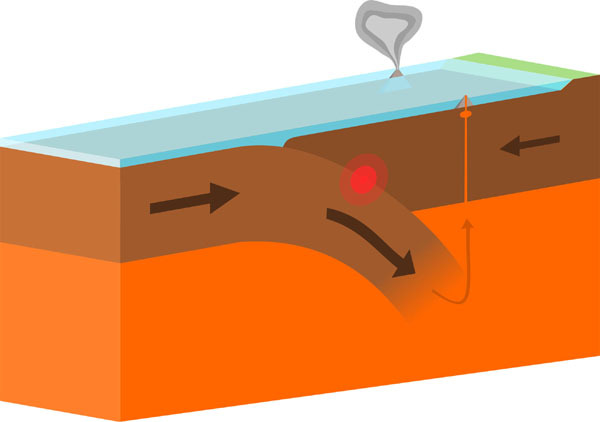 If subduction happens with two ocean plates, one goes under and causes a chain of volcanoes, which will eventually breach the ocean surface and become land. These volcanic islands will form a subtle arc shape in relation to each other because a planet is a sphere. A deep ocean trench will also form. This can be over two miles below the rest of the ocean floor there. It can also be a hundred miles away. If we have a sea monster we’d like to give a home to, here is where it lives. In a world with sea monsters, a place like Hawaii would be prone to at least one creature; it almost doesn’t make sense for one not to be there. At a continent-to-continent boundary, the plates can converge, fold, and lift, forming very tall mountain ranges with no volcanoes. These will be the tallest ranges on our world, located in the interior of continents. 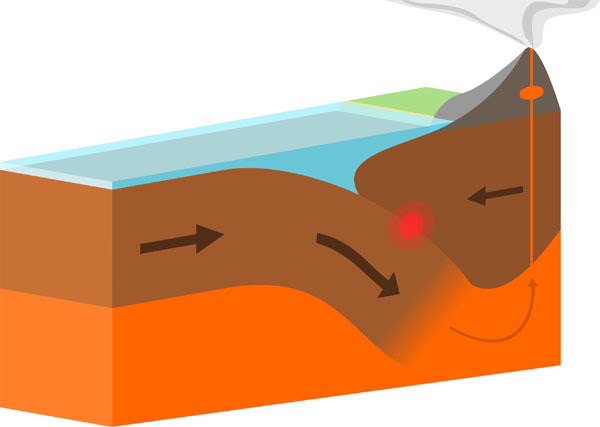 When two plates move away from each other underwater, small volcanoes form, which can result in volcanic islands. When this happens on land, a low area of land can form and then fill with ocean water to create a sea. The Earth continents were once a super continent that broke apart. Divergent plates caused this. Evidence is apparent just from looking at the globe, as South America and Africa look like adjacent puzzle pieces. We can use the same idea for our continents, a small detail that may impress an audience if they notice. Transform boundaries means two plates grind past each other without destroying either. These plates sometimes slip suddenly, causing strong earthquakes. Aside from this, evidence of their existence is less obvious. There are no mountains or volcanoes. If a paved road is broken, one stretch having moved ten feet away, this means the roads spanned the fault, an earthquake happened, and now the road will never connect unless repaved. We needn’t consider this when drawing continents.